Green Lullaby does not pretend its products are going to last forever; rather, this company fully embraces the concept, with all their products made from recycled, recyclable corrugated cardboard. Far from flimsy, the furniture takes some hefty weight limits – the Benz Bench and Table can handle as much as 120kg, meaning you can sit down and get creative with the kids. I absolutely adore the notion of a cardboard cradle for a newborn. They’re needed for such a short amount of time and the Eco Cradle is easy to transport around the house and simply folds flat for storage. Your children will love the dollhouse and cradle, so beautifully decorated for hours of pretend play. The set of three Multiboxes are an aesthetically pleasing storage option for toys, as well as making neat seats for anyone up to 50kg. All Green Lullaby products are coated in a non-toxic fire retardant. 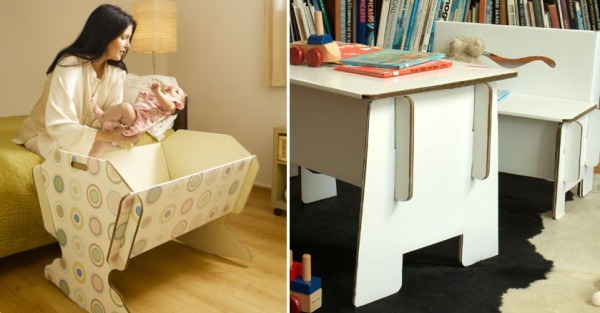 We’re so glad this awesome concept for children’s furniture and toys has come to Australia. Green Lullaby is available through Black Eyed Green, who stock exclusively eco-conscious products for kids. Prices range from $80-$90 for each piece.